First things first: don't be embarrassed that you forgot your Windows 8 password. We're told over and over again to make longer and more complicated passwords to help keep our data secure, which makes them harder and harder to remember. Who are we trying to keep out here? Most of these tips work exactly the same way for Windows 10, some work on all versions of Windows and some will apply to any forgotten password. Even if your Windows 8 password wasn't that difficult to remember — you're human. Everyone forgets things now and then, even important things! Fortunately, there are a number of ways to get back in if you forgot your Windows 8 password, all of which we detail below. Some of these ideas only apply if you log in to Windows 8 using a local account (you log in with a traditional username). Some work only if you're using a Microsoft account (you log in with an email address), and some work for both. We'll let you know each time. However, all of these ideas apply equally to any edition of Windows 8 or Windows 8.1 you may be using. An option you were given when you first bought your computer or installed Windows 8 was to sign up for a Microsoft account or sign in with your existing Microsoft account. One really big benefit of doing that is that it gives you an escape plan if you ever forget your Windows 8 password. So grab your smartphone, or any other computer, pull open your favorite browser and reset your Microsoft account password for the full tutorial. You can reset a forgotten Windows 8 password online like this only if you're using a Microsoft account. If you're using a local account, your password is not stored with Microsoft online and so can't be reset by them. A Windows 8 password reset disk is exactly what it sounds like — it's a floppy disk, or flash drive, that can be used to reset your Windows 8 password if you forget it. If you have one, this is the time to find it and use it! Unfortunately, it's that if you have one bit that will probably have you moving on to the next idea. A password reset disk is tied to your specific Windows 8 account, meaning that one has to be created from within Windows, back when you actually knew your password. In other words, if you don't already have a Windows 8 password reset disk, your chance to create one is over. Once you get back into Windows 8 using one of the other ideas below, please create a Windows 8 password reset disk so you can avoid all this trouble next time you forget your password. Creating, and thus using, a password reset disk is only an option if you log in to Windows 8 using a local account. Before you roll your eyes at this one, give it a shot. Seriously try this, if even just to humor us. Guessing is probably the first thing you did once you realized you forgot your Windows 8 password, but were they educated guesses or just a few frustrated tries? Yes, there are several geeky ways to hack yourself back into Windows 8 but before you spend all that time and energy with those, give educated guessing a really good last shot. Those are just a few ideas on how to successfully guess your own password. If more than one person uses your computer, and at least one of those other people is configured as an administrator, that person can log on with his or her password and change your password for you from the User Accounts applet in Control Panel. You can only have an administrator on your computer change your forgotten Windows 8 password if your account is a local account. The other administrator user can have a Microsoft account or a local account, but your account must be a local account to have your password changed this way. Resetting a Windows 8 Password With the 'net user' Command. 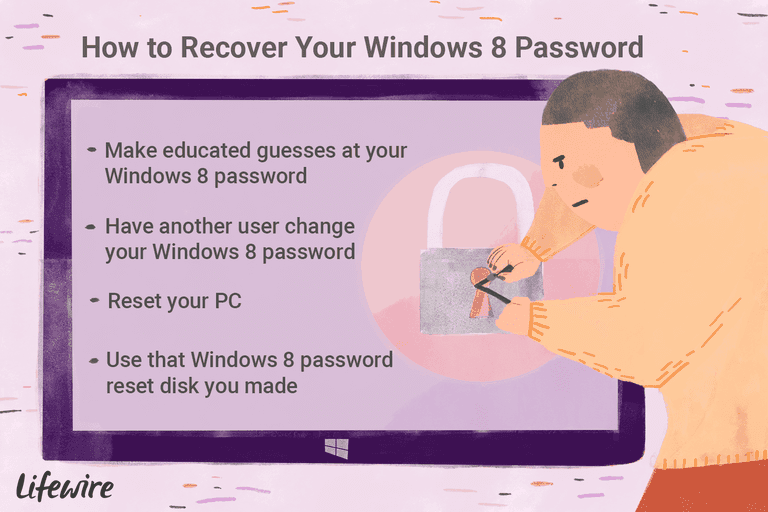 The word "hack" might be pushing it a little, but there is a free and relatively simple procedure you can follow that allows you to reset your Windows 8 password if you've forgotten it. With this hack, you'll be able to reset your Windows 8 password right from the Windows login screen, without a password reset disk or flash drive, and without any need for third-party software. You'll have to use Command Prompt and do some things you may have never done before, but follow our instructions closely and you'll get through it fine. This hack will only work if you log in to Windows 8 with a local account. Several other sites recommend this process for Windows 8 in all cases, but it will not successfully reset your Windows 8 password if you're using a Microsoft account to log in. If for whatever reason, the almost-always-work ideas above weren't successful for you, it's time to move on to some more "traditional" means of hacking into your computer. A number of software-based hacking tools, called Windows password recovery programs, are available from various companies and software developers. Depending on which program you choose to use, it may actually find and show you your forgotten Windows password, or it may simply reset it, allowing you to log in without a password at all. We talk about a number of password recovery and reset tools in that list of programs linked above. For the most part, the password recovery programs work for both local and Microsoft account passwords. The password reset tools will only reset your forgotten Windows 8 password if you're logging on with a local account. The Reset Your PC process in Windows 8 is very different than just resetting your password. This process removes all of your installed programs, apps, and even all of your saved data. In other words, you get to log in to Windows again because your computer is reset back to its initial configuration, just as it was when you bought it or first installed Windows. To complete the Reset Your PC process, access Advanced Startup Options and then choose Troubleshoot > Reset Your PC. See How to Reset Your PC in Windows 8 for a full walkthrough of this process. This is obviously not a great way to get past a forgotten Windows 8 password but if all else fails, this will almost certainly work. You'll have the option of creating a new local account or Microsoft account. If you happen to have a second Microsoft account you do know the password to, you'll have the option of signing in with that. In very rare cases, where you've both forgotten your Windows 8 password, and Reset Your PC isn't functioning for some reason, you can choose to clean install Windows 8 as long as you have a Windows 8 setup disc or flash drive available. Performing a clean install of Windows 8 accomplishes the same thing as a Reset Your PC.